Sam Simon’s dog costs $140,000 a year to care for—and no one wants to pay. Here’s how to leave your pet money and avoid an estate fight. Pets that are bequeathed fortunes, or parts of fortunes, are something of a tabloid staple. Sam Simon, the late co-creator of The Simpsons, wasn’t just renowned for being “brilliantly funny,” as Matt Groening once put it. He was also an animal lover and generous philanthropist in the field of animal rights. So it’s a bit depressing that his death this past March has generated a textbook case of what happens when a wealthy owner tries to leave some of his fortune to a well-loved pet—and the immediate result is a big, ugly estate fight. No, what follows has nothing to do with Santa’s Little Helper. Instead, it’s the true-life tail—I mean tale!—of just how careful even the wealthiest of people need to be if they plan to leave money for the care of animals. After he was diagnosed with cancer in 2012, Simon asked Kilmer to give the dog a home after his death. This was no small request, and not just because of the dog’s history. Kilmer estimates Simon was spending about $140,000 annually on the troubled but clearly well-loved animal, including $7,500 a month on almost daily training and more than $3,500 (also a month!) on twice-weekly acupuncture sessions. (Before you start with the only-in-California jokes, know that doggy acupuncture is available in New York City and Washington too.) Moreover, Kilmer came to believe special enclosures would need to be built to contain the dog. All together, he said after Simon’s death he would need between $1 million and $2 million to care for the dog over time. According to Kilmer, Simon promised financial arrangements would be made. The problem: There doesn’t appear to be a provision for that level of spending into the charitable trust that was the beneficiary of Simon’s estate, which is likely worth several hundred million dollars. After an acrimonious back-and-forth between Simon’s estate and Kilmer—including a dispute over whether Kilmer should be paid for training sessions with a dog that is now in his full-time possession—the executor for the trust cut Kilmer off. The trainer says he can’t ultimately keep up with Columbo’s expenses (who could?) and is now considering launching a GoFundMe campaign to pay for the dog’s continuing care. So what went wrong? Pets that are bequeathed fortunes, or parts of fortunes, are something of a tabloid staple. Most famously there was Trouble, a Maltese of uncertain temperament, whom Leona “Queen of Mean” Helmsley attempted to endow with $12 million while stiffing two of her four grandchildren for “reasons which are known to them,” as her will put it. 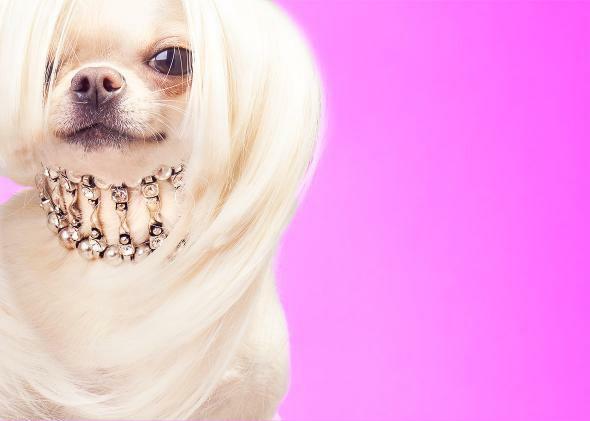 More recently, a Chihuahua, Maltese, and Yorkshire terrier—described as “sisters” by their late owner, socialite Gail Posner—received a $3 million trust fund. Others leave smaller, though still significant, amounts. The designer Alexander McQueen established a 50,000 pound trust—that’s about $80,000—for the care of his dogs before he committed suicide in 2010. Still, the well-off manage to leave small fortunes for the care of their pets. We may chuckle at these ostentatious bequeathals—Posner’s pooches were also left an opulent Miami Beach home that later sold for $8.4 million—but they carry lessons for people worried about their pet’s care after they’ve passed. The best way to ensure a pet is looked after is to establish a trust specifically designed to do just that—something called (wait for it) a pet trust. These trusts are a fairly recent innovation, dating back to the 1990s. Today, 46 states and the District of Columbia recognize them. Based on the details of the dispute, it’s clear Simon almost certainly didn’t create one. Like any other trust, a pet trust allows for a trustee, one who can step in if there’s a problem—like, say, a designated guardian who’s supposed to be taking the animal for a weekly doggy massage but isn’t doing so. This system isn’t foolproof, however. In fact, it’s actually complicated. The story of Trouble is especially telling. Helmsley famously provided $12 million for her dog’s pet trust. Trustees for the estate quickly went to court, arguing that the amount was excessive, and they got it shaved down to $2 million, which is only a reasonable number in the world of the 0.01 percent. After the dog’s death in 2011, the remaining money went to Helmsley’s main charitable trust … and more about that in a minute. Documentation establishing a pet trust should contain detailed directives about how you want the pet to be maintained, otherwise the executor is free to make changes. When Helmsley was alive, she required her housekeeper and other staff to hand-feed Trouble such things as crab cakes, cream cheese, steamed vegetables, fish, and chicken. After her death, a friend went on television claiming Trouble had been downgraded to canned Alpo—sometimes straight out of the can, because no one with any sense wants to hand-feed a dog that. Moreover, everything to do with the animal should be contained within the trust. Trouble caused problems here, too. Helmsley had left her octogenarian brother $10 million and custody of the dog in her will. Her sibling happily accepted the money but didn’t want Trouble, who was literally known for biting the hands that fed her. Mercifully, it is a truth universally acknowledged that a dog in possession of a good fortune will not be in want of a home, and Trouble spent the final years of her life in Sarasota, Florida, under the care of the general manager of a Helmsley hotel. One last thing about Helmsley: Her will left a directive that much of her money go to animal-welfare causes. Unfortunately, the passage wasn’t written in a legally enforceable way, and her trustees didn’t honor that request. A number of animal rights organizations took their grievance to court, where their claims were dismissed. Forward recently reported that Helmsley’s trust—at the direction of its trustees—now dedicates a significant portion of its funding efforts to Israeli-based charities and causes, an issue Helmsley wasn’t known to care about in her lifetime, though the paper helpfully pointed out she did know a few words of Yiddish. Whether it’s a pet trust or a human trust, these documents are inherently fallible unless written in the strictest terms. Helmsley is no longer here, and designated surrogates are in charge. Which brings us back to Columbo. Simon, too, is no longer with us. As ridiculous as this sounds, if he wanted his dog to continue to receive acupuncture, he needed to put it in writing. A friend of Simon quoted in the Hollywood Reporter wondered why the trust didn’t simply continue paying the cane corso’s bills, but it’s not that simple. This is the spot where it appears misunderstandings have compounded. A number of charities have stepped forward, all but howling they’re due money from Simon’s estate. Crisis PR superstar Matthew Hiltzik, who was brought on by the executor, says all due care is being taken; Simon’s directions are being followed; and, anyway, they’re still in the process of settling the estate, and all the charities Simon wanted to help out will be helped out. As for Kilmer, Hiltzik says the amount of money requested is “inappropriate under California law.” Grrr. And it goes on, with nasty accusations flying in several directions. Death, unfortunately, has a way of bringing out the worst in everyone. The greater the financial stakes, and the more people involved, the greater the chances someone will be unhappy somewhere in the process. This is why a separate pet trust could have been an enormous help. No one would have to guess how much money Simon wanted spent on his pet or whether the trainer should be compensated for his time continuing to work with a dog that is now, for all intents and purposes, his pet. It would have been on paper. It’s unfortunate Simon—or one of his many advisers—didn’t think of it. One last point, for us pet owners among the 99 percent. Yes, there are other ways to care for a pet after the owner’s death that aren’t quite so extravagant. There are pet-protection agreements, which can be found online for less than $100 and are quite legal, if basic. There are also a number of programs that will take the pet or find it a home, in return for a payment from the estate. Kansas State University’s Perpetual Pet Care Program, for example, charges $25,000 to $50,000 per animal and is currently managing the care of dogs, cats, horses, and birds. Meantime, the process of settling Simon’s estate continues. On Thursday, Sotheby’s is auctioning off a passel of his memorabilia. If you’re a dog lover, you might want to check out lot No. 127: a Simpsons cel featuring Santa’s Little Helper. The presale estimate is $300 to $500. And yes, the money will go to dogs and other animals, as well as a number of other charitable causes, just as Simon’s trust dictates.